Oceanstyle seems to be cornering the market in Rodriguez superyachts for sale as, following last week's news of their signing up two Mangustas, Hanneke Maljaars confirms that four Leopard motor yachts have joined the sales fleet. The list's headed by the 32m Concept, built in 2006 and offering accommodation for nine guests in four cabins including a full beam master cabin with Jacuzzi ensuite. In addition to the main saloon, there's also a separate lounge area forward of the helm station. 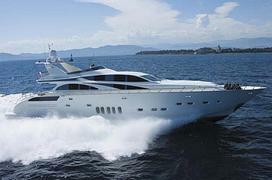 With a top speed in excess of 35 knots, Concept is asking €5.5 million. Then there's the 27m Mr Mach 5, built in 2007 and boasting a four cabin layout with two doubles and two twins. Commercially registered, she has excellent charter potential and is priced at €3.5 million. The 24m London Dream was built to RINA class in 2006 and her KaMeWa water jet propulsion system gives her a cruising speed of 34 knots and a top speed of around 38 knots. With room for seven guests in three cabins, she's asking €2.2 million. Finally, priced at €1 million, comes Aston a Leopard 24 built in 2001 which is, according to Hanneke, "A discreet, fast and very comfortable yacht." The lower deck lounge area includes a work space with desk and entertainment area and she sleeps six guests in three cabins.